(20150.2, Carl Reynard Collection, OHS). Although vague reports of cowboys striking for higher wages in the Oklahoma Panhandle emerged around 1883, organized labor officially entered present Oklahoma with railroad workers and miners in Indian Territory (I.T.). The Federal Writers' Project of Oklahoma reported in a 1939 study of labor that in August 1882 the first union in I.T., sponsored by the Knights of Labor, organized miners at Midway. By 1894 mining strikes had occurred at Alderson, Hartshorne, Lehigh, Krebs, and Coalgate. After 1894 the Knights of Labor began to lose prestige and membership. The United Mine Workers of America (UMWA) had a strong presence in the territory by 1898. The UMWA, founded earlier in Ohio and affiliated with the American Federation of Labor (AFL), pioneered early industrial unionism. Peter Hanraty helped lead I.T. miners in a UMWA strike that lasted from 1898 until 1903. The action resulted in a 1903 agreement with mine operators that guaranteed most of the strikers' demands, including recognition of the union, an eight-hour day, and payment of wages twice a month. Higher wages and shorter hours remained a constant theme in Oklahoma labor history. As railroads began to intrude on the territory, their workingmen also brought unions. In 1883 the Brotherhood of Locomotive Engineers organized. The Order of Railway Conductors and the Brotherhood of Locomotive Engineers soon followed in 1889. The Brotherhood of Railway Carmen of America, along with the other railroad unions, founded locals at Chickasha, Haileyville, Hugo, Muskogee, South McAlester, and Sapulpa. With the opening of Oklahoma Territory (O.T.) these unions added branches in Oklahoma City, Shawnee, and Enid. The Railway Carmen held successful strikes in Chickasha and Shawnee in 1907. Agricultural unions also made their way into present Oklahoma very early. The Farmers' Alliance, founded in Texas in the mid-1870s, had members in Indian Territory and published a newspaper, the Alliance Courier, in Ardmore. Although the alliance's strongest years occurred too early to have a strong presence in Oklahoma Territory, other cooperative unions filled the gap. In O.T. and I.T. many farmers grouped together to form cooperatives that facilitated not only the marketing of their products and the purchasing of equipment, but also sponsored community sales. In 1902 the Farmers' Educational and Cooperative Union, created in Texas, emerged as the strongest in the two territories. In 1905 at a Shawnee convention the I.T. and O.T. unions merged into the Indiahoma Farmers' Union. The leadership of William H. Murray and Campbell Russell assembled a particularly strong and influential body. After a brief split over the question of single statehood, the groups became the Farmers' Educational and Cooperative Union of the State of Oklahoma, known as the Oklahoma Farmers' Union, as 1907 statehood approached. Trade unions organized in the larger communities in Indian Territory. Typically, these would be carpenters, painters, typographical workers, hod carriers, and other skilled or unskilled workers. By 1903 Chickasha had eight unions, Shawnee seven, McAlester four, and Ardmore two. These unions were also organized early in Oklahoma Territory. The bricklayers of Oklahoma City first organized in 1893 and in 1900 reorganized as Local Number 1, becoming one of the strongest unions by statehood. Oklahoma City's Typographical Union 283 received a charter in 1894. 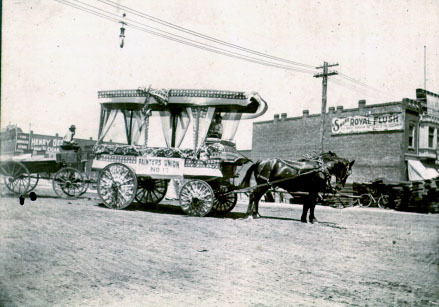 In 1900 nine craft unions established the Oklahoma City Trades and Labor Council. By 1935 the council consisted of fifty-eight individual unions and wielded civic and industrial power in the city. By 1903 the organization, at the time known as the Oklahoma City Trades and Labor Assembly, published a newspaper, the Labor Signal. In 1908 the council sponsored the Labor Unit, until the State Federation of Labor took over and changed the newspaper's name to the Oklahoma State Federationist. On December 28, 1903, the Twin-Territorial Federation of Labor (T-TFL) was formed in Lawton from locals in Oklahoma Territory and Indian Territory. American Federation of Labor (AFL) president Samuel Gompers issued the charter for the T-TFL in 1904. Unions in both territories had affiliated with the AFL since its formation in 1886. The T-TFL represented twelve thousand members in 1904, with coal miners and craft unions providing the core. Peter Hanraty served as first president, and J. Harvey Lynch, who initiated the merger, functioned as secretary-treasurer. In 1906 the T-TFL, the Oklahoma Farmers' Union, and the railroad brotherhoods each held their conventions in Shawnee. The Enabling Act had already been passed, and labor planned to shape the new state's constitution to reflect their organization's goals. In September they jointly released the Shawnee Demands, which considered labor and social issues. These twenty-four demands included the initiative and referendum, the eight-hour workday, compulsory education, a request for a commissioner of labor, and a ban on contract convict labor. A Democratic-controlled Constitutional Convention, with Peter Hanraty as vice president, crafted most of the demands into the document. Free textbooks printed by the state, sanitary inspection of homes, and a powerful, elected corporate tax commission were demands that the delegates considered but passed over. At the convention Charles Haskell introduced a resolution, which was adopted, that presented Samuel Gompers with the pens used to sign the Oklahoma Constitution, "in commemoration of the first Constitution that has ever been written in the United States in which the labor interests have taken a part, the same protecting the interests of the common people more fully than any other Constitution in the United States." The Twin-Territorial Federation of Labor became the Oklahoma Federation of Labor (OFL) after statehood. Oklahoma residents elected Charles Daugherty, a printer and president of Oklahoma City Trade and Labor Assembly, as the first commissioner of labor. In the first twenty years of state government the legislature appeared favorable to labor issues. They initiated a Bureau of Factory Inspection that enforced laws governing safety, child labor, and employment of women and regulating food-manufacturing establishments. The 1915 state house passed a worker's compensation law, but the state senate weakened it with amendments. The legislature also created the State Board of Arbitration and Conciliation to help settle conflicts between labor and employers, with varying degrees of success. The early period of statehood witnessed the rise of the Industrial Workers of the World (IWW), the Oklahoma Renters' Union, and the Working Class Union (WCU) in Oklahoma factories and fields. Socialist leader Oscar Ameringer wrote the constitution for the Oklahoma Renters' Union, an agrarian-based organization affiliated with the Socialist Party. Also rooted in the Socialist Party, the IWW and the WCU earned reputations for direct action and violence in achieving their goals. The IWW, created in 1905 at Chicago, organized industrial workers and in Oklahoma had some success with its Agricultural Workers Organization and Oil Workers' International Union. The WCU, based in Van Buren, Arkansas, attracted many tenants and small landowners, who at first were not allowed to join the IWW. Vocally opposed to the imposed cattle dipping for Texas fever and conscription into the U.S. Army during World War I, the WCU acted, destroying vats and property and participating in the ill-fated Green Corn Rebellion. These acts led to the disintegration of the Socialist Party, the creation of an Oklahoma criminal syndicalism law to prosecute members of these groups, and reciprocal violence, including the beating of sixteen IWW members in Tulsa. After World War I ended, Gov. James B. A. Robertson's administration dealt with multiple labor actions. These included strikes by coal miners, Oklahoma City bricklayers strike, Oklahoma City packing-plant workers, which led to a lynching, telephone operators in Drumright, and streetcar operators in Sapulpa, among others. The next governor, John C. "Jack" Walton, gained the office after endorsement by the Farmer-Labor Reconstruction League, a conglomeration of labor unions, the Farmers' Union, and remnants of the Socialist Party that joined forces to enact favorable labor legislation in this period of agricultural and industrial unrest. Walton turned on his backers, and, with his mishandling of the other duties of his office, the legislature soon impeached him. Labor disputes dropped proportionately in the United States in the late 1920s, with the lowest number since the 1880s occurring in 1930. As the Great Depression gripped the nation, Pres. Franklin D. Roosevelt implemented his New Deal. The 1933 National Industrial Recovery Act (NIRA) had the largest effect on unions by guaranteeing workers the right to organize and bargain collectively. After union membership had fallen dramatically in the 1920s, economic conditions and the NIRA helped overall membership triple from 1932 to 1939. In this period the AFL encountered competition. In 1935 the International Typographical Union and four smaller unions broke with the AFL to create the Congress of Industrial Organizations (CIO). The CIO actively recruited mass-production workers, breaking from the AFL's tradition of only including specialized crafts. The CIO also earned a reputation for having radical, left-wing leadership and for actively recruiting African American members. Oklahoma mirrored the national scene. New organizations emerged to challenge the OFL, and radicalism again infused the young organizations. In 1932 Ira Finley's Veterans of Industry of America (VIA) organized in Oklahoma City and soon had a very large membership throughout the state. The VIA had an unrealistic objective of encompassing all unemployed state workers, but it did attract thousands of Oklahomans. The VIA aimed to provide a voice for indigent workers and to end poverty, with goals that included old age pensions and a graduated land tax. Considered radical in comparison to the OFL, the VIA did have strong women leaders, including Lorena Keeler, but had separate African American locals during the organization's life. The VIA faded after World War II and by 1947 was mostly defunct. Another agrarian-based organization, the Southern Tenant Farmers' Union (STFU), also developed in eastern and southeastern Oklahoma. With a motto of "land for the landless," organizer Odis Sweeden brought the Arkansas-based union to the tenant and poor farmers of the poverty-stricken area. Instrumental in forcing the Oklahoma Legislature to pass the Landlord and Tenant Relationship Act in 1937, which was repealed in 1939, the STFU in Oklahoma faded as communist elements gained a foothold in its chapters, and its leading advocate, Sweeden, left Oklahoma for a time. As some Oklahoma unions turned to the CIO, many residents pointed to communist agitation as the force behind labor unrest. The Communist Party in Oklahoma, although weak, formally advocated (as did the American Communist Party) infiltrating organizations and affecting political direction from within. The VIA and the STFU provide examples of this strategy. In 1933 Finley took a strong stand against communists in the VIA, after discovering his Oklahoma City branch had a strong communist contingent. He had the branch charter revoked, and the VIA state executive board publicly denounced communism, barring its followers from the organization. In the late 1930s the militant Workers Alliance, originating in the northeastern and midwestern United States, had a strong communist affiliation and battled the VIA to organize Oklahoma's unemployed. In the 1930s strikes again erupted around the state with the mining, textile, meat-packing, and oil industries leading the way. In 1931 eight hundred coal miners joined a strike in Henryetta. In 1935 the CIO affiliated International Union of Mine, Mill, and Smelter Workers went on strike in the Tri-State Lead and Zinc District, which had seen little union activity prior to the Great Depression. A rival union, the Tri-State Metal Miners and Smelter Workers Union, known as the Blue Card Union (BCU), offered an attractive alternative with its back-to-work policy, but the operators actually controlled the BCU. Violence accompanied this dispute until the National Labor Relations Board (NLRB) ordered the operators to desist in encouraging membership in the BCU, as it was a company union. Commander Mills, a textile plant, the Wilson Packing Company, Armour Packing Company, Oklahoma National Stockyards, Sinclair-Prairie Oil Company, Champlin Refining Company, Jones Oil Company, and the Mid-Continent Refinery all had employees that engaged in high-profile strikes. Unions remained viable in the years before and after World War II. In 1939 Oklahoma had almost thirty-four thousand labor union members, ranking it thirty-first in the nation in number of adherents. The ranking held steady at thirtieth in 1953 with almost eighty-six thousand members. After World War II ended, radical unions lost their luster, and Oklahoma lost many of its workers to the West and North. The CIO and AFL had both agreed to refrain from striking during the war and to submit disputes to a mediation board. In 1947 the national Taft-Hartley Act banned the closed shop, allowing states to enact right-to-work laws, required union leaders to pledge that they were not communists, and committed the NLRB as a neutral intermediary. In 1948 the CIO worked to expel its communist factions, and in 1955 the two largest unions merged into the AFL-CIO. The Oklahoma affiliates reunited in 1957. Despite some of the labor setbacks engineered by the Taft-Hartley Act, the 1950s and 1960s held economic prosperity for American workers as the middle class grew, wages skyrocketed, and workers attained benefits other than pay, such as vacations, group insurance, and pensions. In 1960, 71,198 Oklahomans belonged to a union. Tulsa had the most organized workers, with 29,657 or 9.9 percent of its population; the Oklahoma City area boasted 17,226 union members or 4.3 percent of its residents. Of El Reno's 11,015 citizens, 13.4 percent held union membership, the largest in the state. Labor activity did not disappear, however. The United Auto Workers (UAW) represented workers at aircraft plants from the 1950s as the United Automobile, Aircraft, and Agricultural Implement Workers of America, long before this large union oversaw workers at the Oklahoma City General Motors (GM) plant. In 1955 the UAW called a strike at the Aero Design and Engineering Company (later Gulfstream). With the 1977 establishment of the GM plant, the UAW became a strong force in Oklahoma's union community. In 1979 Oklahoma City schoolteachers, represented by the American Federation of Teachers, walked off the job. The Daily Oklahoman estimated that half of the twenty-three hundred classroom teachers went on strike for twelve working days in a dispute over wages, overtime, and planning periods. The Oklahoma Education Association had lost the right to bargain two years earlier, and teachers associated with that union returned to work after the second week. This effectively ended the strike. General Motors, Wilson Foods, AT&T, and Dayton Tire are among the major Oklahoma companies that have dealt with labor strife since 1984. In 2000 Oklahoma had ninety-four thousand union members, or 6.8 percent of the employed population. The average wage per job was $24,578, ranking Oklahoma at forty-fourth out of the fifty states. In 2001, after years of struggle, 54 percent of Oklahomans voted to approve "right to work," joining Texas, Arkansas, and Kansas in ending the union shop principle. The effect of this on Oklahoma unions remains to be seen. The AFL-CIO still retained a strong presence in the state at the beginning of the twenty-first century, representing the American Federation of Government Workers, Hotel and Restaurant Employees, American Federation of Teachers, National Association of Letter Carriers, International Association of Machinists and Aerospace Workers, and forty others with hundreds of locals. Milton E. Asfahl, "Oklahoma and Organized Labor," (M.A. thesis, University of Oklahoma, 1930). James Paul Bailey, "Standing Out for Their Rights," The Chronicles of Oklahoma 76 (Fall 1998). William E. Cullison, "An Examination of Union Membership in Arkansas, Louisiana, and Oklahoma" (Ph.D. diss., University of Oklahoma, 1967). Federal Writers' Project of Oklahoma, Labor History of Oklahoma (Oklahoma City, Okla.: A. M. Van Horn, 1939). Arrell M. Gibson, Wilderness Bonanza: The Tri-State District of Missouri, Kansas, and Oklahoma (Norman: University of Oklahoma Press, 1972). Patrick E. McGinnis, Oklahoma's Depression Radicals: Ira M. Finley and the Veterans of Industry of America (New York: Peter Lang Publishing, Inc., 1991). James C. Milligan, Oklahoma Farmers' Union: A History of the First 91 Years (N.p. : Cottonwood Publications, 1997). Frederick L. Ryan, A History of Labor Legislation in Oklahoma (Norman: University of Oklahoma Press, 1932). Sherry Warrick, "Radical Labor in Oklahoma: The Working Class Union," The Chronicles of Oklahoma 52 (Summer 1974). Larry O'Dell, "Labor, Organized," The Encyclopedia of Oklahoma History and Culture, https://www.okhistory.org/publications/enc/entry.php?entry=LA003.